You also will get this split album from Extreminal Distro and Total Death Productions soon. Underground death metal scene's the one of the the most cult bands,Incantation,is workin' on a new album which is not named yet and this album workin' will continue through a couple of months and the album will be released in the year of 2006. American labelled brutal death metal band,Goratory have signed a contract with Grindethic rec. for two-unreleased album for future.The band is thinking over to record a mini-album nowadays.This album is supposed to be released in this summer. Italian old school black-thrash band,Necrodeath,will be released the comin' soon album named "100% Hell" in April,17 by Scarlet records. - Black Bleeding "The awakening"
This 2 tracks CD has only a promotional issue; it can and will not be sold. Nevertheless, you can get this CD by buying a T-shirt or sereval CDs but it will depend on the available stocks. Dannish death metal band Crucifix's vocalist Jens Killhailer has lef the band. Official statement from Jens: "I have decided to step down from my position as the vocalist in Crucifix. Originally I was only supposed to help the guys as a session singer for a while but the band took more and more of my time and money mainly due to the four hour distance and the time has come to go our separate ways. I am not really into modern death metal at all and my heart lies more in old school satanic black / thrash death metal. I am currently very busy with my other bands Victimizer and Church Bizarre and recently I have accepted the offer to be the singer in a well known black metal legion. On top of all this I also have a lot of work with my record label/distribution Pentagram Warfare. I wish the guys the best of luck in their search for a new vocalist and we will always remain friends. My final work in Crucifix will be helping them out with one more live show and recording vocals for the next demo". Skinless has just entered studio to record new studio album, called "Trample the Weak, Hurdle the Dead". 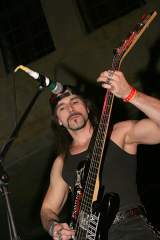 Original RAZOR bassist Mike Campagnolo has returned to the group in time for their appearance at the Montreal Metal Massacre on December 10 at Le Spectrum in Montreal. Mike will also be joining the recording process for the new RAZOR CD, due out in 2006 on The End Records in North America and Mausoleum Records in Europe. A DVD of live material from the '80s is also expected to be released in 2006, along with the reissues of "Shotgun Justice" (1990) and "Open Hostility" (1991). Look for RAZOR to do some extensive touring of Europe and North America next year, possibly with PILEDRIVER (who are playing at the Montreal Metal Massacre as well) or with ONSLAUGHT and HEATHEN (an offer is reportedly on the table). In related news, RAZOR frontman Bob Reid's solo project BOBNOXIOUS will be releasing their Christmas album, "Ho Ho Ho", on December 1. The CD contains seven tunes "to warm your chest/nuts" and is being released in a limited edition of 1,000 copies, with all proceeds going to The London Food Bank. BOBNOXIOUS will be performing live on the Christmas float in this year's Santa Claus Parade, taking place on Saturday, November 26 at 6:00 p.m. in London Ontario. BOBNOXIOUS will also play two Christmas shows: Saturday, December 17 at Call the Office in London and Thursday, December 22 at Fiddlers Green in Cambridge.